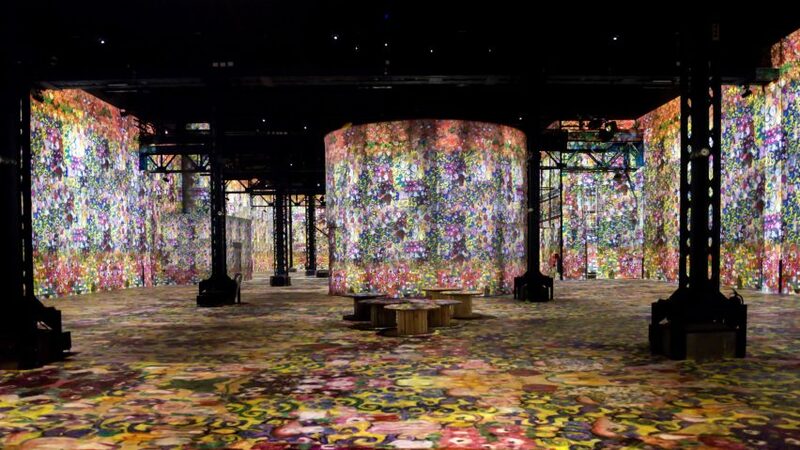 Colourful projections of early 20th-century paintings, including those by Gustav Klimt and Egon Schiele, are displayed at the Atelier des Lumière – a digital museum dedicated to fine art in Paris. Located in a former foundry in the 11th arrondissement, the space is the French capital's first digital fine art museum. Overseen by Culturespaces, a private operator of museums and monuments, Atelier des Lumières features artworks projected onto 10-metre-high walls across a 3,300 square metre area. Reacting to the impact of technology on the way people experience art, the exhibition space aims to make art accessible to a large audience who do not regularly visit museums or galleries. "These immersive exhibitions can be an introductory way to discover pictorial art and such a digital center was lacking in Paris," explained Michael Couzigou, director of the Atelier des Lumières, to Dezeen. The team behind the museum believe that the move towards digital representations of culture is set to increase. "People do not learn about culture as they did in the past," said Bruno Monnier, the president of Culturespaces. "Practices are evolving and the cultural offering must be in step with them. The marriage of art and digital technology is, in my opinion, the future of the dissemination of art among future generations." Monnier came across the disused foundry five years ago. Following the launch of the Carrières de Lumières art centre in Les Baux-de-Provence in 2012, he wanted to create a digital art museum in Paris. The Martin family, owners of the building, offered Monnier the main hall and its annexes in 2014, as a space for the project. The building has three main exhibition rooms. There are two rooms dedicated to Austrian painter Gustav Klimt and a century of Viennese painting, including works by Egon Schiele and Hundertwasser. A smaller room is reserved for emerging artists and features AI and digital installations: "We want to embrace emerging artists on the contemporary art scene," Couzigou explained. "We decided to focus on Gustav Klimt, on the centenary of his death, for three reasons: the variety of his expressive forms, which range from classicism to early impressionism, and his quest to create a 'total art' during the secession (an art movement at the turn of the 19th century), his fame, and the poetic and romantic nature of his oeuvre, which we saw as an ideal starting point," said Couzigou. "We are also including a short programme devoted to the painter and architect Friedensreich Hundertwasser, who was influenced by Klimt's work." The artworks are accompanied by a "motion design" sound system with 50 speakers, which features a soundtrack by Wagner, Chopin and Beethoven amongst others. "It allows visitors to discover art from a new angle and through immersive experiences. We combine classical art and digital art – I am convinced that the marriage of art and digital technology is the future of the dissemination of art among future generations," said Couzigou. "It is able to reach a younger and wider audience than that of the traditional museums. This approach is not intended to replace museums but is a complementary approach to art," he explained. According to the Guardian, more than 400,000 people visited the museum in the three months following its opening in April this year. "We are already thinking about another site in France," said Monnier. Digital art is increasingly playing a part in museums and galleries. Earlier this year, Japanese art collective TeamLab used lighting to create a sea of spiralling whirlpools inside a Melbourne art museum. A virtual vortex created by the collective will open at Helsinki's Amos Rex gallery later this month.